What’s chrain, you ask? It’s a heck of a memorable condiment traditionally found on the holiday table come Passover and, in eastern Europe, Easter. Its bracing robustness is most terrific alongside rich dishes such as deviled eggs, gefilte fish, and roasted hen, although it also works admirably as a dip with crudités. 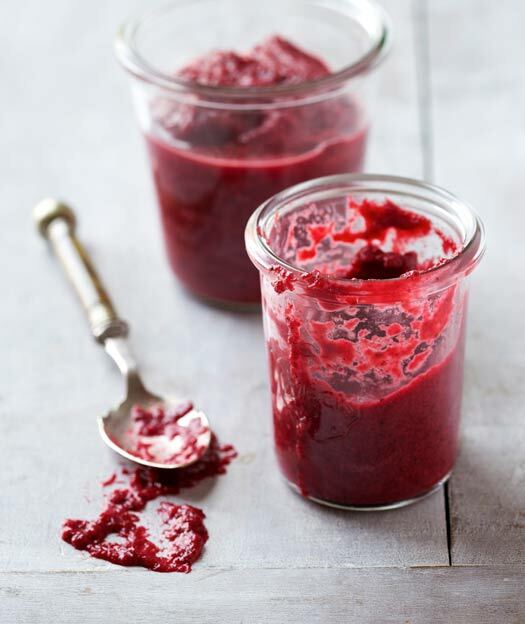 Depending on the precise proportion of ingredients that the cook chooses, the condiment’s characteristics are either that of a magenta beet relish spiked with a touch of horseradish or a clear-the-sinuses horseradish paste with a tinge of pink—suit yourself, tweaking and tasting as you make it. Lurking in some of your minds is no doubt the question, Why make it when I can buy it? In response, we have only to quote LC recipe tester and chrain aficionado Sema Stein: “Although a veteran chrain user, this was the first time I have made it myself. The result was delicious with a serious bite to it. I must say, it is the best chrain I have ever had.” Tasting, it seems, is believing. 2. Place the chopped beets along with the remaining ingredients in a food processor and process until the desired consistency. (Consider adding the smaller amount of salt and sugar for starters, then toss in more if desired.) Taste and adjust the amount of horseradish accordingly. Cover and refrigerate the chrain for up to 1 week. Though a veteran chrain user, this was the first time I’ve made it myself. The result was delicious, with a serious bite to it. I must say, it’s the best chrain I’ve ever had. I will not be buying chrain again. The end result was a beet paste with very small chips of visible white horseradish. I processed the mixture for what seemed like a long time, but wasn’t able to reduce the horseradish root to a paste. I stopped processing due to concern that the beet would become too mushy and not hold up against the gefilte fish that it was paired with. I used cider vinegar and I’d increase the sugar to 1 1/2 teaspoons and reduce the salt to 1 1/2 teaspoons. I didn’t use the garlic. The flavor is good, but the consistency is very different than the beet-colored horseradish you get in a jar. There was an issue with the recipe for me: it called for 3 medium-size beets and a 1-by-3-inch piece of horseradish. I think it had too much beet compared to the amount of horseradish for my taste, but the ratios I used created a very spicy result. The amount of beet I added gave the chrain a more gelatinous consistency than the grainy horseradish consistency I’m used to. The other recipes I found showed a higher ratio of horseradish to beet. But the flavor was good. I used cider vinegar, which imparted the right flavor. No need for the sugar, though, unless spicy isn’t what you want. The color of this alone makes this a winner. The chrain also clears out the sinuses very efficiently. And it’s delicious in small doses. I’ve always purchased red horseradish to use alongside gefilte fish, but never considered making it until I saw this recipe. Armed with a very fresh and aromatic horseradish root that I purchased at the greenmarket, I headed to my kitchen, got the food processor out, and put the beets on to boil. After reading some of the comments I opted to use a larger piece of horseradish, about 4 inches long. I ended up using about 2 teaspoons salt and 1 1/2 teaspoons sugar along with cider vinegar. I opted to omit the garlic. The chrain was delicious and intensely hot, though the beets added sweetness as well as turning the dish a magnificent color. I made it two days before Passover and stored it in a glass jar in the refrigerator, and there was no significant loss of intense flavor. (In fact, a week later my remaining chain is still hot and delicious.) This was a perfect addition to my Passover table and an excellent accompaniment to gefilte fish. It’s also a great accompaniment to matzoh, and we even enjoyed adding a bit of it to chicken salad. The key is definitely a fresh, flavorful horseradish root—the one I purchased at the greenmarket was definitely a superior product to those available at my local supermarket. Also, when opening the food processor, be very careful as the aroma is truly overwhelming. Last, when I work with beets I always cut them on a stack of newsprint to avoid staining my cutting boards and I wear rubber gloves to avoid staining my hands. An easy recipe which has multitude of applications. Starting as a humble dip, it could easily be a condiment or stirred into some soups or stews or added to hummus or just eaten by itself with some fresh pita or naan bread. I used about 2 tablespoons prepared horseradish as fresh was not available to me. Personally, I would add a little more horseradish and a splash of lemon next time I make this. Homemade Chrain Recipe © 2013 Ruth Joseph | Simon Round. Photo © 2013 Isobel Wield. All rights reserved. All recipes and photos used with permission of the publisher. Reminds me of my grandmother. 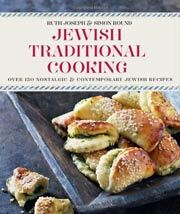 You can bet I will be making this to go with my attempt at Gefilte fish. Wonderful, Janis! We’d love to hear from you after you make it. The swell thing is that you can add horseradish to taste, so you can make it just like your grandmother’s…. This is very exciting. I recently purchased 5 jars of homemade Charain from a women in Colorado that I had tried while vacationing there last summer. She makes numerous flavors accented with Orange zest along with several others. They’re wonderful and had planned to take a couple jars to my moms on Monday. However, now I’ll have to bring my homemade version, thanks to you, with one of the jars I purchased for comparison. Can’t wait to try this. Lovely, Vicki. Please let us know if you add in a bit of orange zest or other flavorings. It sounds like it might me best if you puréed the horseradish on its own first to get it going then add the beets so it comes out close to the same consistency. Just a thought. I’ll pass your thoughts on to our testing crew, Vicki. Thanks! My Polish family serves a relish that is similar, called chrzan, for Easter (pronunciation is pretty similar to the Yiddish). My aunt would boil the beets, but my uncle roasts them in their skins. Either way is fine. They both would grate the beets and horseradish on a box grater till tears ran down their faces! Chrzan stands up well to rich meats and is great with the traditional Easter fare of ham, kielbasa, and boiled eggs. We’d heard rumors of a similar recipe traditional at Easter, Suzanne, so many thanks for clarifying that. I can only imagine the memories you have of witnessing those tear-stained faces as a child. Many thanks for making this recipe nondenominational. I make horseradish every year but never knew it was called chrain. I do it a bit simpler though, just a beet for color, the horseradish and a touch of vinegar. Maybe some salt. Not sure it is the recipe that counts. What counts is getting lucky with a good hot horseradish to clear the sinuses! Sounds like you might need a box of tissue on the side, Abbe! OK, as typical for a Jewish reader, I also have a recipe for chrain. Mine I got from a 96-year-old Jewish bubbie, which makes it VERY authentic. Except for the preparation, which is very modern. You buy a long horseradish root, and if it’s not firm you wet it well and put it very wet into a plastic bag for a few days and it will absorb the water and refresh itself. If it’s hard when you buy it, then start here. Take your 2 medium-size raw red beets and peel them. Your hands will be red, but then all your friends will know what you’ve been doing. Your sink will also be red if you peeled the beets into the sink and then you will have to use cleanser and rub a cut lemon on the porcelain. This is getting to be work. But aren’t you supposed to suffer on Passover? Cut your beets into chunks. Peel the horseradish and cut it into long strips. Set your Kitchen Aid stand mixer on the counter and attach the grinder with the small holes. If you don’t have a grinder, go to the store and buy horseradish already made, it’s easier, quicker and less cleanup, and it tastes fine. Take a plastic bag. A long one, like the kind a newspaper might be delivered in or a big resealable baggie. Open one end and tie it up to the open end of the grinder. The other end, cut open and let it drop into a big quart pickle jar or canning jar like a Kerr or Ball jar. Start the motor on the grinder and start putting the horseradish and beets down the shoot and you will see the perfectly ground texture coming out into the bag and dropping into the jar. When you are done, take a long spoon and mix in white vinegar and some water to wet the mixture and then add salt and some oil, but just a little splash and then a little sugar. Mix well and let sit for a day and mix again and adjust salt and sugar. The color will be pink the first day and turn deep deep beet red as the days go by. stu, i could sit and listen to you tell stories such as this all day long. all. day. long. many thanks for sharing, i love the spirit behind this recipe. This is a popular side dish in Eastern Europe. Horseradish root (“hren”) is commonly added to jars when preserving vegetables for winter. I love this, Anna. What other vegetables are commonly used? Basically horseradish is used as batonnets in all kinds of pickles (dill, sauerkraut, insanely good sauerkraut-filled peppers, green tomatoes, cauliflower, carrots etc.) My grandmother preserved whole green peppers only with horseradish and tap water and never failed, all were good and firm when taken out to be stuffed. She put a couple of batonnets inside every pepper and then tucked them one inside the other, making sort of a “pepper tower”. Needless to say, we are not talking 16 ounces here, but 10 to 20 liters (3 to 6 gallons) or even wooden barrels for sauerkraut. My mother makes two kinds of chrain: one with cooked beetroots and one with raw. You need to very finely grate the horseradish, and the beetroots as well, but separately. Mix them by pulses in the magimix. And season them at the end with sugar and salt dissolved in vinegar. No need for oil, especially not olive oil. Divide into small amounts in glass jars to keep the sharpness. Thank you, your mother’s chrain sounds fabulous, and we so appreciate you sharing her tried-and-true techniques. I’m certain I’m not the only one who appreciates them and will be incorporating them into my next batch…. Wayyyyy over here on the other side of the planet, in .au, my Polish-origin mother also makes this Easter specialty. Fresh horseradish root used to be hard to come by, so she has always used the jarred variety. Like Miss Fortier above, it is eaten traditionally on Easter Sunday bruch with the various divine Polish sausages and boiled eggs, and ham. Thank you for posting this recipe, I will share it with her and compare notes, then look forward to our Easter feast! Can’t wait to hear, Eva. Will you make some for her to compare? P.S. Pinned to my Jewish Holidays board. Lovely, Lori Lynn and thanks for the pin! No horseradish available here in inland Spain, would wasabi do, tastewise??? Ooooh Richelle, I’d hesitate before using wasabi. It’s similar to horseradish and yet quite different in the particular type of heat that it packs. But I like the way you’re thinking. Can you perhaps find some jarred prepared horseradish and use a spoonful or so of that?